(I did a ch 32) Make sure it’s snug. It will loosen up a bit later. Important: Hdc stitches tend to make a diagonal seam when joined. To counteract this, ch 1, hdc in next st, skipping the same st(ch 1 does NOT count at first st). Hdc in each st around, work 2 hdc in last st, and join with the first hdc (not the chain.). Work two rounds this way, and the third round normally by ch 1, hdc in same st and working a hdc in each st around, joining in the first hdc. Repeat this 3-round sequence in rounds 1- 11. Ch 1. Hdc in same st. Hdc in next st. Hdc 2 in the next st. *hdc 2, 2 hdc in next st* – work all around your arm warmers. Join with first hdc. Hdc a few more stitches around that with the right. It doesn’t need to be exact, use your arm to estimate a good place to put the thumb hole so the seam is on the underside. Ch 1. Hdc in same st. Hdc in each st around. Join with beginning hdc (use the method above to avoid slanted seam). Tie off and weave in ends. I love these cute little things! I keep mine on my desk by my computer, and slip them on when my hands get a bit cold. 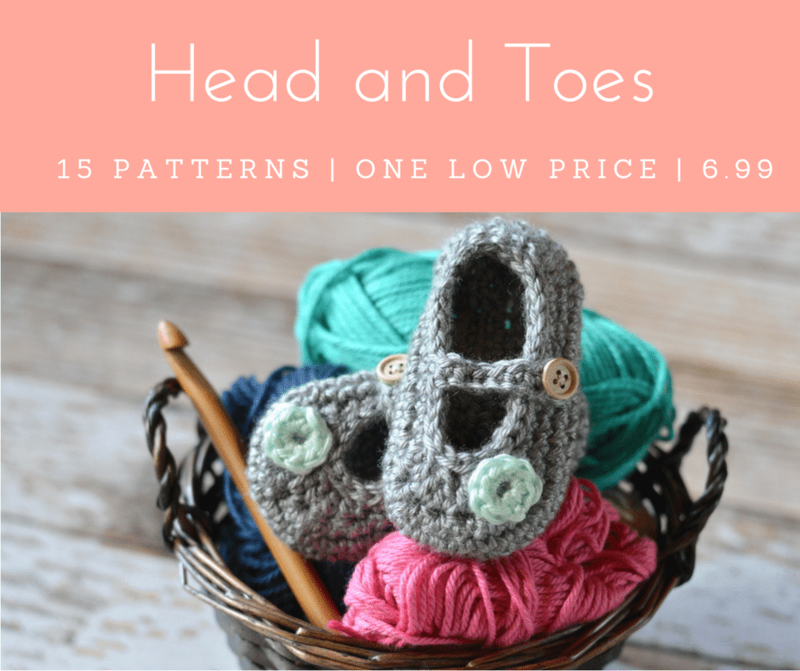 Be sure to subscribe so you don’t miss any patterns or projects, and follow me in Instagram and Pinterest. Share what’s on your hook! 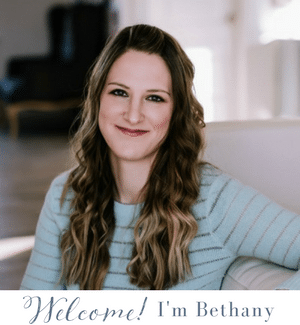 Join with Whistle and Ivy Facebook Group. How would I go about making the thumb a little…longer? Meaning, how do I make it so the thumb is covered more, instead of just a hole in the pattern? Another darling pattern. Thanks. I am printing it as I write this. I’ve made two pairs of these for two grandaughters. I just need to put the bows on them. Thanks for the pattern, Beth. What is the gauge on these? 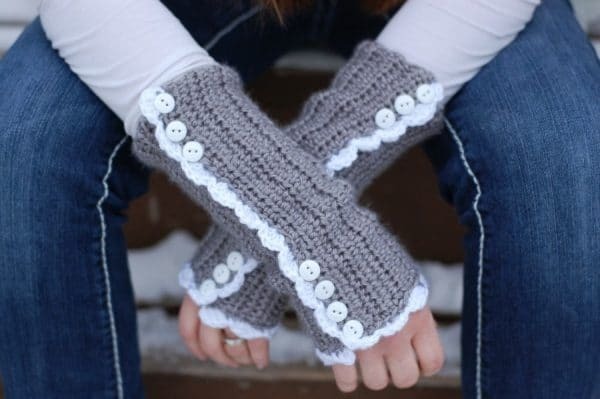 i would like to make these with a different yarn and the gauge would be great. thanks again. Hello! I didn’t include gauge because you use your own forearm to custom make them for yourself. Does that make sense? 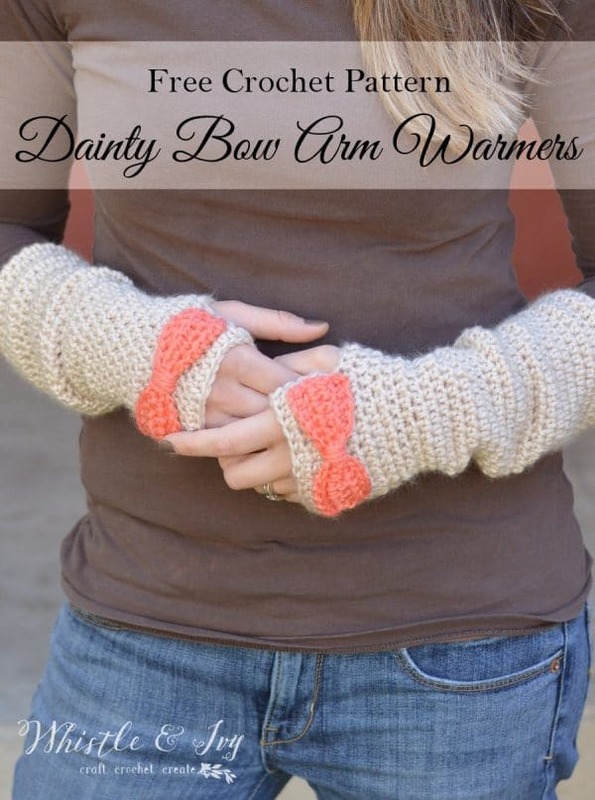 You can use the pattern with any yarn and any hook, using your forearm to have them fit you. I included the stitch counts for the arm warmers that are fit to my arms for reference. There is no specific gauge, you simply use your own arm as a guide to make them fit your arms perfectly (see the note by the beginning chain). Any yarn will work great! Yes, I think they would be too long! 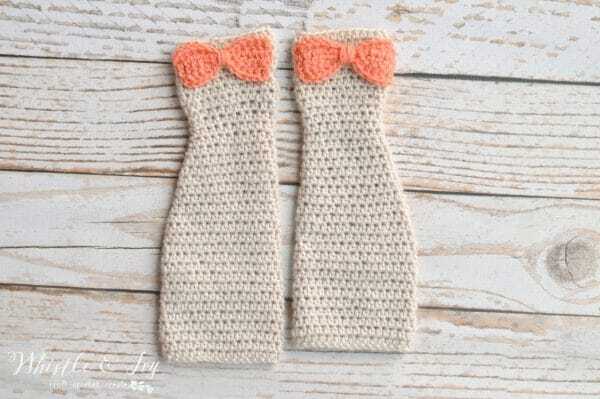 I haven’t made arm warmers for a child, so I would not be much help, I am sorry! I love your page. Makes me want to weave everything I see here. All very nice! Thank you very much for sharing patterns for all of us. A hug! So lovely! I love these warmarms.Thank you for the pattern. I made these for my daughter for Christmas, now she wants a pair in black and another pair for a friend. I did my decreases a little different, did “2 hc together” instead of skipping the first stitch, I just like the look better love the pattern, will be trying some of the others. Thanks for sharing. I love these bow wristers! I want to crochet a pair for my 9 year old grand daughter but I’m not sure how to go about altering the number of chains or if that’s even possible. If you have any suggestions, I’m all ears. Thank you! Yes! You should be able to begin with a chain that fits around her forearm, and do the rest of the directions accordingly. Hi! I absolutely love this pattern and adore arm warmers in general. But I have attempted to make these twice now and am not getting a good result :( The HDC decrease rows leave an ugly seam on mine, my hand portion ends up too fat and where i start to decrease has somewhat of a “point”. I am following your pattern exactly (or so i think lol) but maybe there are just things im not doing right I would love some advice so I can make a pair im finally happy with! You can email me back if thats easier for you. I did try using your method for a straight seam, and all was going well until i got to the decreases. I have a feeling my yarn is too stiff which is causing it to look like a “point”. Gonna try a different yarn and see how that turns out. Thanks again. Hm. I haven’t had that happen. Maybe work the last 2 hdc less frequently, instead of 2 in a row. It’s so strange how different yarn works up so differently! How many skeins of yarn does it take to make these? Less than one for the body, and only a few yards for the bow. Love these! But, I’m coming up with 10 rows after 3 rounds of doing the diagonal seam instead of 11. What row could I be missing? There is no missing row, you work the sequence until you can to make 11 rows. Does that make sense? You won’t end up making an exact amount of each row. 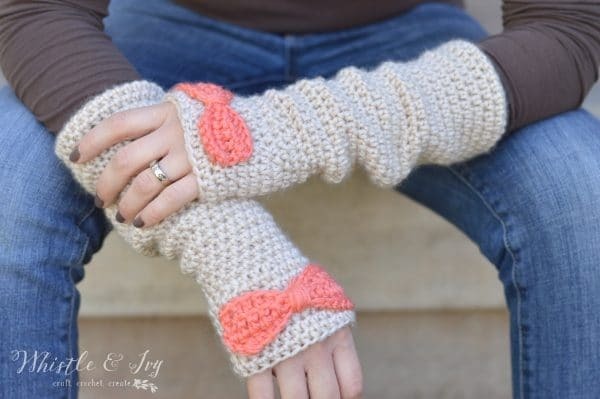 I do not crochet but love these arm warmers!!! The gray ones with white buttons and trim. How could I order some? Thank you! I am sorry, I don’t make and sell finished items. Hi I am confused on Row 12. What does sk same stitch mean? I am mostly a self taught crocheted but I love this pattern!! Hi Melanie! It means “skip”, so you will skip a stitch and work in the next one. It basically is a decrease, so the hand warmer tapers and gets smaller. Let me know if you have more questions! I am sorry I didn’t include that in the abbreviation list, I will add it now. Hi. 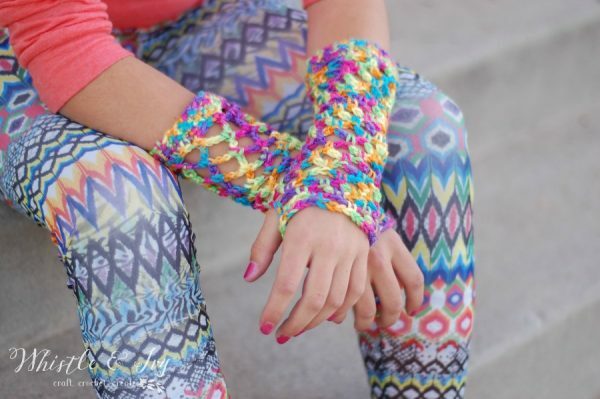 I love these armwarmers but im confused about row 27. Is that 2hdc and then another 2hdc or was it a typo?? It’s an increase–> hdc, hdc, 2 hdc in next st. 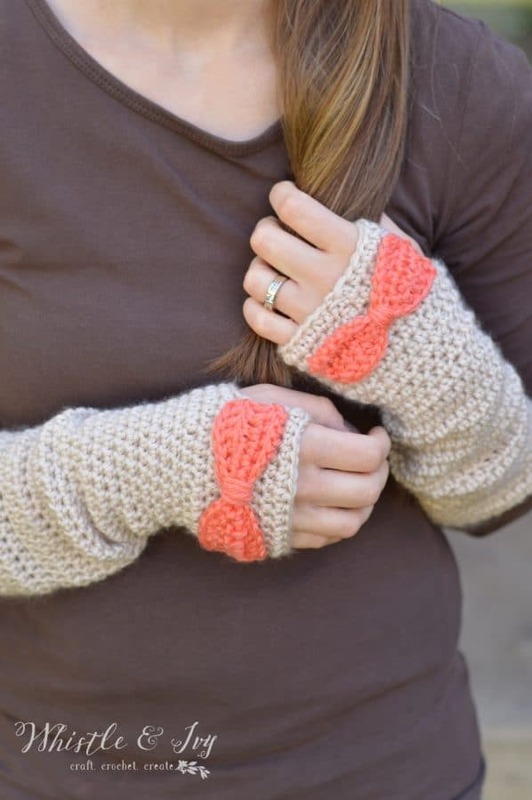 I am making these and was wondering what store bought yarn is comparable to this yarn as I need it now.These are so cute! I also am having problems. So this is hdc, hdc two single hdcs and then 2 hdc meaning two more all in same stitch? I am not sure I understand your question. You will work hdc 2 in the same st (this is the increase). Then 2 hdc each in their own stitch.